Prospect Equine Farms partners local well known area trainers to enhance it's training facilities specifically designed for training eventing and dressage prospects with special emphasis on Warmblood Crosses. In the fall of 2013 training shifted to Dreamcrest and Ian Roberts has now been working with both Stephen and Mitchell Hall as they train their curent mounts. In the fall of 2013 Melanie Thomson began regular dressage training sessions at Prospect Equine for Prospect Horses and our boarders. Click here to learn more about Melanie. In addition to regular training sessions with Melanie, clinics with Julie Watchorn, Esther Mortimer and more will augment the training of Prospect Horses. Boarder can participate in Dressage Lessons as arranged. 1 Indoor Stall Board Currently available. Indoor Board is $750.00 including HST. 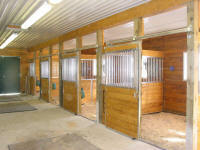 Stalls have soft stall flooring. Indoor board includes winter blanketing, fly mask on/off and fly spray in summer. Horses always brought in during bad weather. Grain included. Small squares inside/round bales outside. Supplements given (supplied by owner). 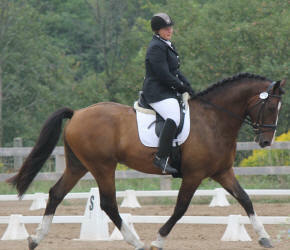 We are a private eventing/dressage barn on 100 acres with a 65 by 160 indoor arena, stalls are soft stall. Excellent care and owners live on site. outside coaches welcome. Bring your own farrier/vet. Regular Dressage coach also available. Large pastures with top quality pasture grasses and custom horse hay. Top quality round bales outdoors during the day in winter with top quality hay feeders. Outdoor board has shelter. Winter outside Heated water, heated tack room. Trails and hacking. Beautiful pastures for grazing. Jumps available for use in the Arena. Arena has mirror wall and viewing area. Grass Riding ring with jumps in Summer.
. All vaccines and up to date Coggins required.